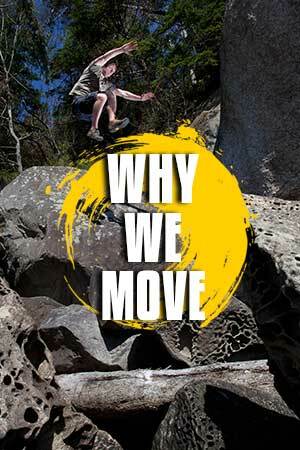 We can conceive of movement as series of techniques, for example cross crawl, squat, kong vault, or split leap, or we can consider movement as adaptions to types of environments. Can I move well going up and down slope, on terrain that is jagged and complex, or smooth and soft, terrain that is wet or dry. Can I move through tree limbs and across rock faces and the many other expression of the environment. The fact most of our physical culture is conducted primarily in gyms and artificially constructed environments leads us to focus on specific movement patterns primarily rather then asking how well we can solve the myriad of different environments we evolved for. If you can run a 6 minute mile on flat ground you might think you are a competent runner but do you have the freedom to run across all types of terrain? If you can do many different beautiful transitions in quadrupedal movement maybe you consider your self good at locomotion, but how well can you recognize when to use quadrupedal movement and sliding going up or down hill? To be competent in movement you must be able to solve problems with your movement and solve them reflexively in the moment. There is the skill of running up a hill, and the skill of doing quadrupedal up a hill, and the skill of doing crab walk down, and the skill of sliding down. Then there is the skill of recognizing what the right movement pattern is in each phase, the skill of transitioning smoothly between patterns, and the skill of adapting something goes wrong. All of these are contained with in the skill of ‘moving on slopes’. This is what our movement evolved for to allow us to adapt to our environment. Plus its super fun! To try this out for yourself find a relatively soft dirt slope to start with, work on running up it and recognizing when you can move faster by dropping to all fours. Coming down see if you can gain momentum by sliding on the side of your hip like a baseball player and how well you can transition from running down into the slide and back up. Want to learn more about our approach join us for upcoming events in philly, san francisco, amsterdam and the northwest.